Are you Ready for Wildfire? Fire season in Marin is just a few weeks away. As spring turns to summer, and our green hills begin to brown, the threat of wildfire looms. Prepare your home, family and yourself – together we will be ready! 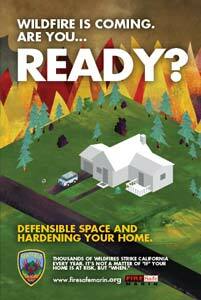 The time is now to create and maintain your Defensible Space. Visit www.firesafemarin.org to learn more. Kentfield Fire Protection District is a special district formed under the authority of the California Health and Safety Code. The District has an excellent Class 1 ISO (Insurance Services Office) rating. Twelve full-time professional firefighters and five volunteer firefighters are employed by the District. All District personnel are State certified to their classification and rank. The District’s daily staffing is four firefighters. Available within minutes are four neighboring automatic aid engines, twenty immediate need mutual-aid engines, and eight immediate need “wildland” mutual-aid engines and four truck companies. The District is a member of the California Inter-County Mutual-Aid Plan and the Marin County Automatic and Mutual-Aid Plan, covering emergencies and disasters such as fires, floods, mass-casualty incidents, and earthquakes. All District personnel are Hazardous Materials First Responder Certified. The Kentfield Fire Protection District provides paramedic service through the Ross Valley Paramedic Authority Joint Powers Agreement. All District personnel are Emergency Medical Technician Certified. For the purpose of mitigating serious hazardous material incidents, the District participates in the Marin County Hazardous Materials Joint Powers Agreement. All District personnel are Hazardous Materials First Responder Certified. All District personnel are provided with extensive structural and wildland fire fighting, rescue, medical and emergency management training in accordance with Federal, State and locally accepted standards. The California Fire Code and Public Resource Code are adopted and enforced by the District. Annual inspections of commercial and residential occupancies are conducted. The Kentfield Fire Protection District's mission is to minimize the loss of life and damage to property, and the environment, resulting from fires, medical emergencies, and other disasters. Knowing that firefighters are held to a higher standard of conduct, the firefighters of the Kentfield Fire Protection District will make every effort to uphold those standards that are entrusted to us. We will take an active role in maintaining a professional image of the Fire Service through promptness, efficiency and dedication to duty. We will serve the public with courtesy and respect, providing assistance wherever our skills and talents are needed. We will be ever vigilant in promoting awareness of fire hazards and in educating our citizens of all ages. We will adopt technology on the web and other mediums to communicate with residents, visitors and businesses.